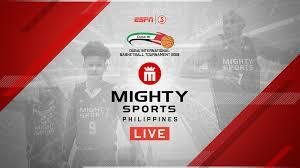 Watch the 2019 Dubai International Basketball Championship game between the Mighty Sports Philippines and the Al-Wahda Syria Today, February 6, 2019 (Philippines) at the Hall Al Ahli Club - Dubai. Tip off 1AM (Manila Time). The Mighty Sports entering this match with a record of 3W-0L and at the 1st in the Group B standings. They won their last 3 games against the American University, UAE National Team and Homentmen Lebanon on February 4th. On the other hand, the Al-Wahda Syria coming to this game with a record of 2W-0L and at the 2nd spot in the Group B standings. The Syria team won their last 2 games over the American University and United Arab Emirates National Team.